Aron Hegarty is a Cork actor, writer, spoken word poet, storyteller and voice over artist based in Dublin.Aron is a graduate of the full time Bow Street Screen Acting Program for film and he has had TV roles in; Resistance, Younger, Vikings, Ripper Street, Game of Thrones, Rebellion II, as well as various short films including great success with Leap of Faith, which he has a nomination for best actor in from the Underground Film Awards 2018. Previous theatre Credits include: The Shaughraun; The Boys; Fighting Words; The Untold Story of Captain Hook; Me Sara; Here There and Now; The Dream of Eithlinn; The Shadows of the Tain & Buchaill Buí; Trainspotting; Macbeth; The Ice Child; Which Crazy Cat Are You. Aron’s voice has been used for this years Munster Rubgy TV advert, RTE Folk Awards and My Taxi as well as previously being used for The Irish Examiner, Bus Eireann, Lidl, Carrols Ham, Heineiken and SPAR. Aron is the co-founder of his own Theatre and Storytelling Company Candlelit Tales. You can see Aron host these popular story nights across various venues in Dublin as he regales audiences with the age old tales with his unique style and charisma, accompanied by a live musical score. Aron is currently in rehearsals for The Abbey’s production of The Country Girls by Edna O Brien. The show will be stages in the Abbey in from February to March and will tour nationally in April. Three members of the Frontline team will be treading the boards this week in Smock Alley Theatre’s production of Dion Boucicault’s Irish classic The Shaugraun. Aron Hegarty plays the unscrupulous Kinchella with Juliette Crosbie and Jack Mullarkey playing brother and sister Robert and Claire Ffolliott. A comic caper with lots of heart and adventure, The Shaughraun runs from 31st July to 1st September in Smock Alley Theatre. You can grab your tickets right here. Here’s a look at the trailer for the show. Best of luck to all the Frontline actors who are appearing in shows as part of the new work festival Scene + Heard in Smock Alley Theatre at the moment. Jack Mullarkey, Aron Hegarty, Shane Whisker, Madi O’Carroll and John Morton are all appearing in shows over the course of the three week run. You can check out the full programme here. Scene + Heard Festival runs at Smock Alley Theatre from 14th February- 3rd March. Dont miss Frontline Clients Aron Hegarty in Buachaill Buí and Catriona and Cathal Cuig, and Jack Mullarkey in Acronumb. 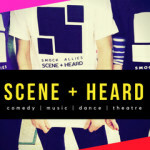 For more details check out the Scene + Heard Program on the Smock Alley Website.